It was my turn to treat rif to dinner when I got my pay cheque. He decided on The Daily Grind. 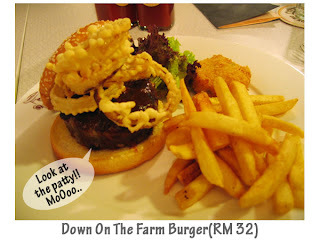 Located on the lower ground floor of Bangsar Village 1, they claim to be a “Gourmet Burger Diner”. We were ushered to a table at a nice quiet corner. 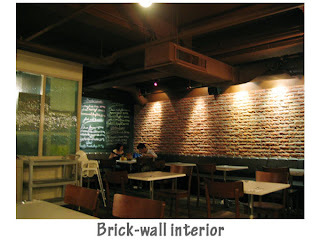 The place has a rustic feel with its red brick-wall interior. 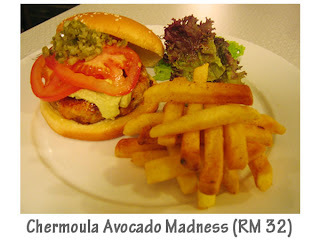 I ordered the Down On The Farm burger while rif settled for the Chermoula Avocado Madness. 20 minutes later, we were happily tucking into our burgers and fresh chunky fries. My burger was pretty good. Juicy, medium rare beef patty generously slathered with smoky barbecue sauce, the patty was thicker than the bun itself. 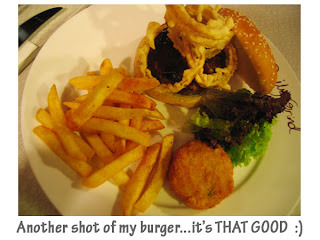 The fried crispy onion rings stacked on top of the patty was excellent and gave the burger a lovely crispy contrast. Ahhhh…a gastronomical adventure. The corn cake, fried to a golden brown hue was not bad but paled in comparison to the burger. The Chermoula burger was also quite good. Both rif and I are avocado fans, so this burger hit homerun with us. Tender and absolutely juicy chicken patty topped with creamy avocado paste, tomato slices and relish, it was deee-licious. The buns were generously buttered and pan fried to a light crisp. The chunky fries were delightfully crispy. 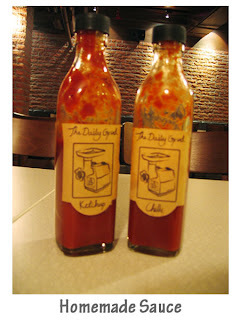 They taste even better when eaten with their homemade chili sauce and tomato ketchup. I think my sauce to fries ratio was 1:1…or was it 2:1? 😛 We didn’t try their desserts as I was eying on the Banana Torte and Tiramisu from Suchan. Overall, it was quite a pleasant experience but we find the burger selection somewhat limited and portions leaning on the small side. Though they make it up with quality, I reckon big eaters would find it insufficient. 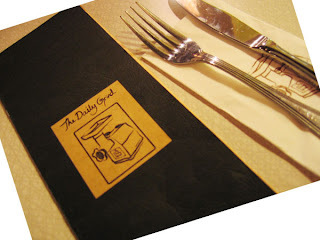 Verdict: Good burgers, small portions, rather pricey. Go try and judge them for yourselves. Wow.. burger after burger post!! i think it was 3:1 ratio.. hehe.. Yes, my designer didn’t do a good job with adjusting the fonts when I migrated the blog.